So it was a really good weekend – Friday night we spent with friends, and one of my greatest friends (who lives in DC) – Coco – got engaged!!!! I am sooooo SOOOOOOOOO excited for her and Eben! They are such a cute couple – at least in photos. I’ve actually not met him yet – something we are going to try to remedy on Wednesday (he is from the Boston area as well, so we will rendezvous in Massachusetts). Coco is just so great – you become a better person just by being her friend! She definitely had to much through some toads to get to her prince (and he is age appropriate! ), but seems to be very worth it. She’s never been as happy as she has been this last year! Boom and I are also excited for selfish reasons – I hope there are some couple’s trips in our future! Saturday I got to hang out with my friend who is also helping me with the house (she is an interior designer) – we went to lots of fun stores! I think we may have found a trestle table for our kitchen! It was nice to see her – seems like we haven’t hung out in quite a while! And Sunday, Boom went to yogidy with me!!! Then breakfast at Buffalo Grille (yummy!) – Yarbs me us there. Then it was finally time for Craft Sunday Afternoon. We were scrappin’ fools! We did 4 layouts each – and 1 was a two page spread! Lots of photos got scrapped. Good time – just made the weekend pass really quickly! And tomorrow we are headed to FW to marm and dads – then Wed morning we are headed to the Cape! I can’t believe it is nearly Thanksgiving – where did November go?! Friday night, my friend E.K. invited Boom and I out, along with four other couples, to celebrate Tan’s (her boyfriend) birthday – at a surprise dinner at Bedford, a new restaurant in the Heights. She is an interior designer and worked on part of the restaurant – it was a beautiful space! We got to sit at Table 1 – the chef’s table! The chef’s table wasn’t supposed to be open for another 2 weeks, but Chef was nice enough to accommodate E.K. and it was a really great experience. We had 7 courses – and he wasn’t even put out by my pescetarianism. Here’s the view from Table 1 – Chef busy preparing the food! He seemed very interesting and talked about his food – it was cool! I just wish we could hear him better, but oh well. And this was such a perfect gift for Tan as he really enjoys cooking! Oh Boom – such a cutie! And check out his new blazer – not too shabby! He was in dire need of a new one, so glad he got it. Boom enjoying some of the food! I thought I wasn’t going to be full, but after 7 courses, I was quite full! Here’s some of the delicious tastes that we had – everything was very tasty! Most of the tasting were not even on the menu – so special!!! I wish I had taken a photo of dessert – it was quite yummy – some sort of a berry concoction, but literally it was in my belly before I realized it! Boom even gave me some of his, nice boy. This is the whole gang that celebrated Tan’s birthday. With Chef Gatsby – Tan was tickled the entire night! EK did a great job with the whole night – and Tan really, really loved it! 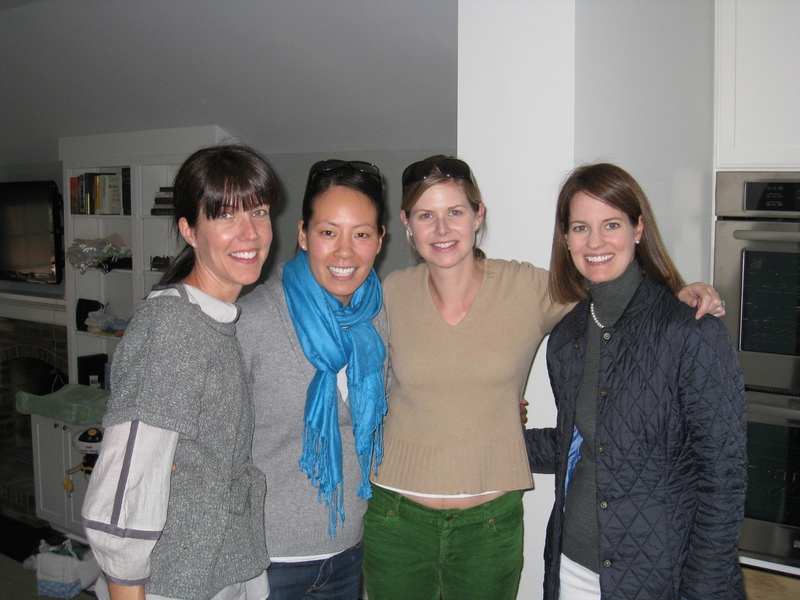 It was a great experience – that was the first time I had ever sat at the Chef’s table! I felt so fancy and special! And a little drunk – each courses had it’s own wine / sparkling wine / sake pairing. I am not so much a fan of sake, so Boom got a double dose of sake (blah). Fun times in H-town! It is starting to feel like home! The last time we were in the Galleria, SANTA was already out, waiting for little kiddies! No takers, I am glad to say. It is way too early for Santa, if you ask me. Thanksgiving hasn’t even occurred yet. But, I already sent off my first (and likely only) ornament for the ornament swap I signed up for. I built on what I had started last year – and incorporated some bling! These are all of the ones I have made thus far. I think this one turned out the best, so I just mailed it off this morning to my ornament swap person. I am just worried they will not like it! Oh well. So here is my 2009 collection so far. I have been winning eBay lots of rhinestone buttons – some vintage, some not. And that is the bling that I am using for this years ornaments. I’ve had a bunch of friends get married, so I am thinking maybe a heart shape would be apropos for this year as well. I’d like to find some other ornament swaps, but not sure if I am too late and not really sure at all where to find them. And with work, I have had no time to troll around the blog-sphere. Which is not necessarily a bad thing. Oh well, just means I get to keep all the ornaments I make – or at least choose whom to give them to! Last weekend we were back in ole Virginny celebrating my great friend Stevie’s wedding weekend! Yours truly designed her symbol and wedding invitation, which both turned out great (if I do say so myself!). Most importantly, she loved the symbol and invitations! Later that night was the rehearsal dinner at the 2300 Club up in Church Hill and then the post rehearsal dinner party at Stevie and Ty’s place (which was just a few blocks away) – complete with kareoke! Boom wasn’t able to fly in until late Friday night, so I was without my pair for all the festivities. Not fun, but helped me to appreciate having him around that much more! Boom got in just fine on Friday night – boy was it nice to see him! He had been out of town since Tuesday, so hadn’t had much together time. 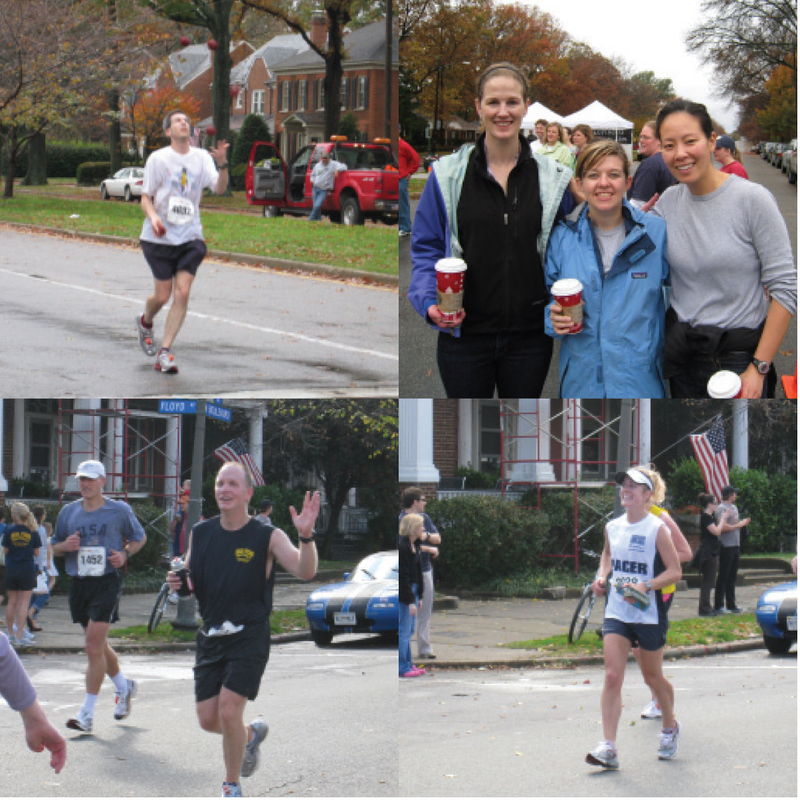 Saturday morning was the Richmond Marathon. We went to watch some of it with Gretty and Cubs. Where we were standing at Mile 4 was quite interesting as there was a Christian rock band playing loud music right behind us. Some of the lyrics were a bit graphic and kinda odd – Cubs agreed, and she is a church go-er, so it is not just my heathen ways. Anyway, I saw my friend Elizabeth, a juggling runner, and lots of Seal peeps, namely Chuckles and Kandy A! Incidentally, Kandy A had been on the course at 3am (!!!) putting up signage. And then she was a pacer for 4:15, but by the time we saw her at mile 18, she had none of her pacees around her! Oh well, she was still on course, so that is all that can be done. Stevie and her priestess are really close, so the homily was so great! It was all about how Stevie and Ty met on MATCH!!! There was a full Episcopalian Mass, which is kinda neat. Boom went and got communion, I went up there, but just got blessed. I like all the traditions and rituals that go along with organized religions like Catholicism and the Episcopal church, but I digress. The reception was in a big old house in Ginter Park that had been converted into a rec center of sorts. It was cool b/c there were 2 stories and the top was just totally open – the bottom had a few really big rooms, and it was just quite neat. 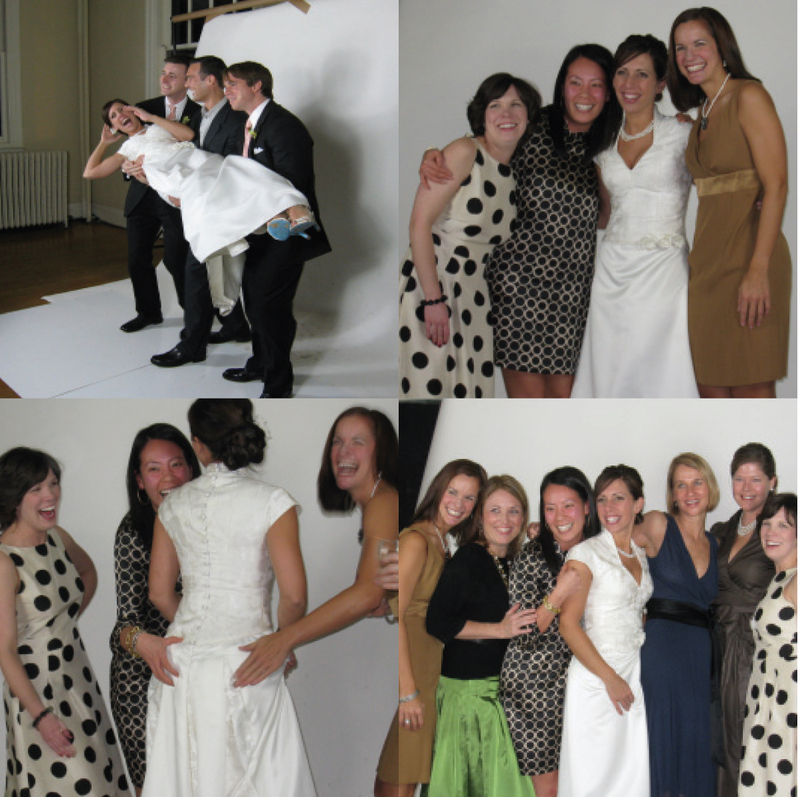 I am proud to say I got the party started with the “photo room” – I love pics of any and all types! So of course I forced Poindexter to take some snaps with me, then we rounded people up, and everyone was getting into it! Fun times! Their cake was the tres leches cake from KubaKuba – so yummy! There was a little snafu – the caterer kinda ran out of food! This was a fellow St. James’er that Stevie used, and it was her first wedding! Luckily Stevie and Ty aren’t the types to totally freak out – they solved the issue by ordering 20 pizzas! and man, those pizzas were yummy! Stevie and her crew did a great job decorating – and their love symbol (as they like to refer to it) took center stage, so to speak! She and her mom even cut a large stencil of the symbol and painted it onto a flag! Loved that idea – so Martha! Everyone had a great time – and I loved seeing Stevie so so happy! She was just radiant! As all good things have to come to an end, our trip to the RIC had to end at some point. On Sunday, we went over to Sam and Josh’s new house (so cute!) and got to hang out with Kathy and Mike and Jojo and Jems. Was really great to see them all – just wish I had had more time to see them during the weekend! And, I don’t know when we’ll be back up! So that is just so sad. (On a bright note, Warren is coming down the weekend of Houston Marathon and will be running the 5k, as will I. So we do have a Ric guest to look forward to!). I am sure I will make it up there again, just not sure when. I do miss all of our friends, but I guess that is just part of moving away. Making new friends just takes time, and we have been doing a good job of it. So things are pretty good – can’t complain! Not quite as famous as Martha, but who is?! Anyway, this past Saturday Yarbs and I went shopping. I wanted to purch a new dress for my friends wedding this weekend – and found 2 that I LOVED – but, of course, they did not have my size. Ugh, just hate that. He looked and sounded just like he does on TV – very tan! He was busy hawing his own line of skincare. Seemed a bit odd to me that he was wearing white pants in November, but I guess he comes from southern Cal where it is warm all the time. Highly random, and amusing. But even better than seeing Dr. Rey was getting to hang out with Yarbs – it had been a long time!